America's economy stayed on track before the U.S. election. The economy added 161,000 jobs in October, a solid gain, suggesting it is maintaining its healthy and steady pace. Jobs added during the previous month were also revised up substantially by the Labor Department. It is the last look at the health of the economy for Americans voters before they cast their ballots next week. Unemployment fell a tick to 4.9%. That's down by half since 2009, when unemployment peaked at 10%. October's gains marked the 73rd consecutive month of job gains for the U.S. economy. "We see so many examples in our data of an economy moving in the right direction," U.S. Labor Secretary Tom Perez told CNNMoney. The September job gains were revised up to 191,000 jobs from the first read of 156,000. Wage growth -- one of the last metrics to move in the right direction post-recession -- continued to show signs of accelerating. Wages grew 2.8% in October compared to a year ago, the fastest growth since June 2009. "We're going to see stronger wage growth going forward as we see a labor market that's approaching full employment," says Jacob Duritsky, vice president at Team NEO, a nonprofit that focuses on economic development in northeast Ohio. 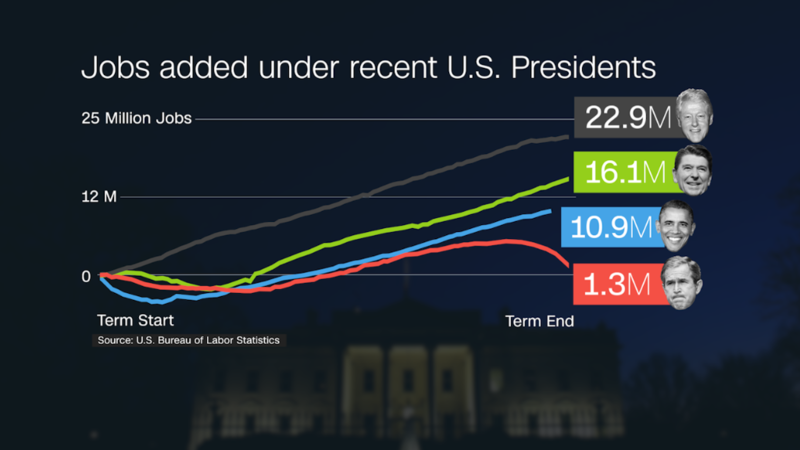 The jobs report has become a divisive subject in the presidential election. Donald Trump has called the official unemployment rate a "hoax" and he's tried to discredit the Labor Department's official numbers. Trump says the unemployment rate is closer to 10%, using a broader measure of unemployment, which also counts some part time workers as unemployed. The Bureau of Labor Statistics, a wing of the Labor Department, has never relied on this measure to describe the country's key unemployment rate. "it's absurd to argue that the Bureau of Labor Statistics is shading the numbers in some way," says Robert Murphy, a professor at Boston College and former economist on the White House's Council of Economic Advisers. The BLS "has high integrity." Trump campaign said in a statement that it was a "disastrous jobs report." He criticized the economy's performance during President Obama's tenure. He also noted the high poverty levels among young black Americans. Overall, the black unemployment rate at the end of October stood at 8.6%, down from a peak of 16.6% in 2010. Both candidates have promised to spend more on building new roads and bridges. Hillary Clinton wants to create a pathway to citizenship for undocumented workers, and Trump has proposed tax cuts and slashing business regulations. Clinton would add more jobs than Trump, according to analysis of both their policies by Moody's, Oxford Economics and UPenn's Wharton School Budget Model. The solid job numbers on Friday come one week after America posted its best quarterly economic growth in two years of 2.9%. Overall, though, growth has been sluggish in the years since the Great Recession, and that trend has been a major issue on the campaign trail. The job market is not free of problems either. There remain a high number of discouraged workers -- people who haven't been able to find jobs in the past year and have given up the hunt. And there's about six million Americans working part-time jobs who want full-time jobs. These trends are near the top of the worry list for policy makers. The strong wage growth in October is a long-awaited and welcome sign for many workers. Stagnant wages have been a major reason why many Americans didn't feel the benefits of the recovery over the last seven years. Solid job gains and wage growth also helps to clear the path for the Federal Reserve to raise rates at its next meeting in December. That would be a sign that America's economy is getting closer to full health. "This will provide comfort to those at the Fed who are ready to increase the federal funds rate," says Joseph Brusuelas, chief economist at RSM, an accounting firm in New York.